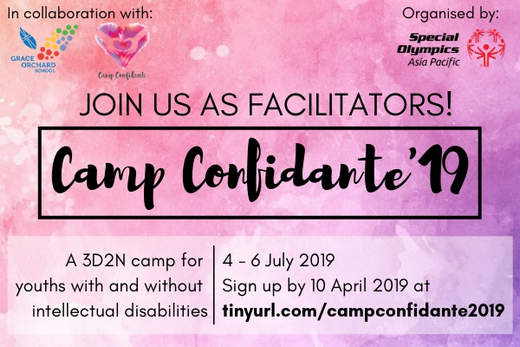 Camp Confidante 2019 is a 3D2N camp which aims to promote social inclusion between youths with and without disabilities. Organised by Special Olympics Asia Pacific in collaboration with Grace Orchard School, Camp Confidante brings together special students from Grace Orchard School and student volunteers from mainstream schools, so as to encourage mutual learning and foster meaningful friendships between special and mainstream students. Grace Orchard School is a school that caters to students who have been diagnosed with Mild Intellectual Disability (MID) and those with Mild Autism Spectrum Disorders (ASD). Facilitators play an important role in this camp, as they will be assisting in the organisation and running of activities. Importantly, they will be in charge of leading groups of special and mainstream students, who will be paired up. For this camp, the organisers are looking for facilitators aged between 17 and 25 who are open-minded and eager to contribute to this cause. Facilitators are also required to possess strong communication and leadership skills as they are required to lead groups of student volunteers and their buddies. The actual camp will be held from 4 July 2019 (Thur) to 6 July 2019 (Sat). Other key dates include the volunteer orientation on 27 April 2019 (Sat) and two pre-camp sessions on the 22 May 2019 (Wed) and 28 May 2019 (Tue). Interested members are to sign up via the link tinyurl.com/campconfidante2019 latest by 15 April 2019 (Mon).